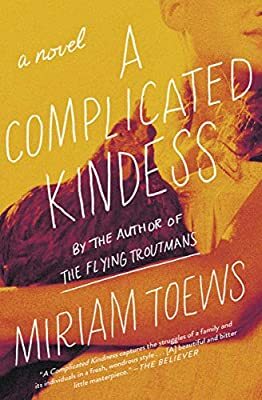 Author: Toews, Miriam Set In . . . Description: “A darkly funny and provocative novel” of family, faith, and adolescent angst from the award-winning author of All My Puny Sorrows (O, The Oprah Magazine). “Half of our family, the better-looking half, is missing,” Nomi Nickel explains at the beginning of A Complicated Kindness. Left alone with her sad, peculiar father, her days are spent piecing together why her mother and sister disappeared, dreaming of escape, and contemplating her inevitable career at Happy Family Farms, a chicken slaughterhouse on the outskirts of East Village. This is not the East Village in New York City, where Nomi would prefer to live, but an oppressive town founded by Mennonites on the cold, flat plains of Manitoba, Canada. A wry yet bewildered sixteen-year-old, Nomi is trapped in a town governed by fundamentalist religion. In her droll voice, she tells the story of her eccentric, loving family whose members each find themselves on a collision course with the only community they’ve ever known. Winner of the Governor General’s Literary Award and drawing comparison to J.D. Salinger’s Catcher in the Rye,“A Complicated Kindness just may be a future classic in its own right” (Philadelphia Inquirer).